We're making Nevada Sun Smart. Sun Smart Nevada was developed in response to the U.S. Surgeon General's Call to Action to Prevent Skin Cancer, released in 2014. Sun Smart Nevada is building programs for sun safety and skin cancer prevention in schools, work places, and outdoor recreational areas throughout the state. 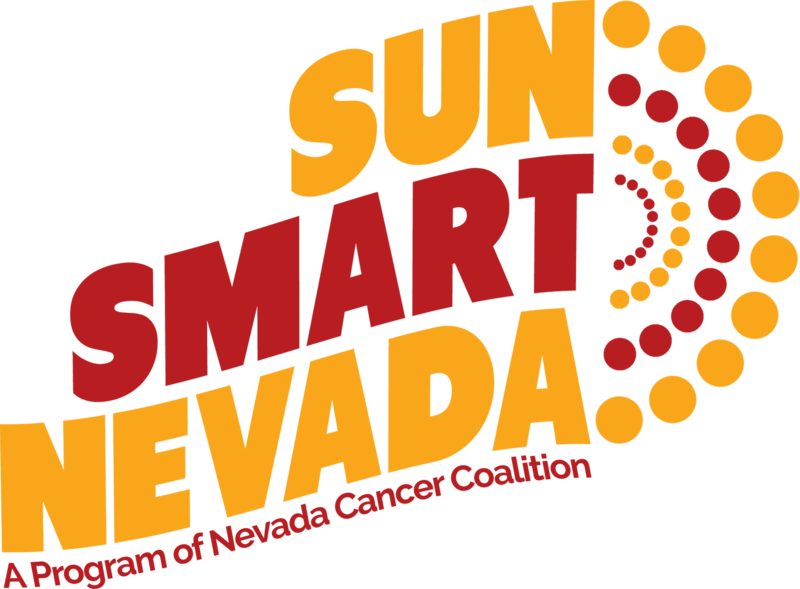 Sun Smart Nevada's community outreach team brings sun safety to events and organizations throughout the community. Armed with portable automatic sunscreen dispensers, a shade tent, and a skin analyzer machine, the team teaches the importance of the 5 S's at events ranging from organized runs and community festivals to health fairs. The outreach team also works with community organizations to expand access to sunscreen and assist them in promoting sun safety at their activities and events. It’s estimated that one in five Americans will be diagnosed with skin cancer in their lifetime; and one person dies from melanoma – the deadliest form of skin cancer – every hour. In Nevada an estimated 790 residents will be diagnosed with melanoma this year. Each year there are more new cases of skin cancer than the combined incidence of cancers of the breast, prostate, lung, and colon. When caught early, skin cancer is highly treatable. The two most common types of skin cancer, basal cell and squamous cell carcinomas, are highly curable. Melanoma, the third most common skin cancer, is much more dangerous. Monthly head-to-toe skin examination is recommended by dermatologists and skin cancer prevention organizations, and anything spotted that’s suspicious should be checked out by a doctor. Information on how to do an examination and what to look for are available online at SkinCancer.org. The majority of skin cancers are caused by exposure to UV radiation. Nevada receives nearly 300 days of sunshine annually, meaning UV radiation is often present. The best prevention is to protect skin from UV radiation by following the 5 S’s: Slip on sun protective clothing, slop on broad-spectrum sunscreen with an SPF of 30 or greater, slap on a wide-brimmed hat, seek shade or shelter, and slide on UV-protective sunglasses. One last tip is to avoiding indoor tanning. Those who use indoor tanning devices before age 30 increase their lifetime risk of melanoma, the deadliest form of skin cancer, by 75 percent. Nevada was the 4th state to ban youth under 18 from using indoor tanning devices as of July 1, 2013. The law also requires tanning salons to display warning signs stating the dangers of indoor tanning and collect customer release forms acknowledging the dangers of indoor tanning. We encourage employers to share sun safety information with their employees, particularly those who work outdoors. Presentations can be tailored to meet your needs and fit within the time available. Complete the form below to sumbit a Sun Smart Nevada presentation or outreach request. Slip on sun protective clothing. Slop on broad spectrum SPF 30+ sunscreen. Slap on a wide-brimmed hat. Seek shade or shelter, especially from 10a.m.- 4p.m. Slide on UV protective sunglasses. A: Asymmetry. If you draw a line through the middle, the two sides should match. If the two halves do not match, it could be a sign of melanoma. B: Border. A benign, or harmless, mole has a smooth border. Uneven, jagged, or irregular borders could be a sign of cancer. C: Color. Most moles are one color. Moles that have a variety of colors or change color over time should be evaluated by a doctor. D: Diameter. Moles that are larger than 6mm in diametes, about the size of a pencil eraser, should be checked by a doctor. E: Evolving. Moles that change over time, whether getting larger or changing color, itching, bleeding, or crusting, could be cancerous and should be evaluated by a doctor. F: Feeling. Has the sensation or feeling around the mole changed? Does it itch or is it painful? Learn more about how to perform a skin self-examination and see examples of what to look for from the Skin Cancer Foundation. Tools like the moble app Mole Mapper can also help you to track your moles over time and identify changes. Ask your hairdresser or barber to check our scalp for suspicious moles or lesions. They may see things that you cannot. If you have a personal history of skin cancer, or a history of skin cancer in your family, let your doctor know so they can perform a skin check or refer you to a dermatologist for regular exams. Automatic sunscreen dispensers and sunscreen refill pouches are available for purchase from BrightGuard through NCC, and a portion of each sale benefits NCC and the Sun Smart Nevada program. *Dispenser releases 1 ml of sunscreen per dose. Each case of sunscreen includes 4-1,000 ml pouches. For information on sunscreen and ingredients, please visit the BrightGuard website.